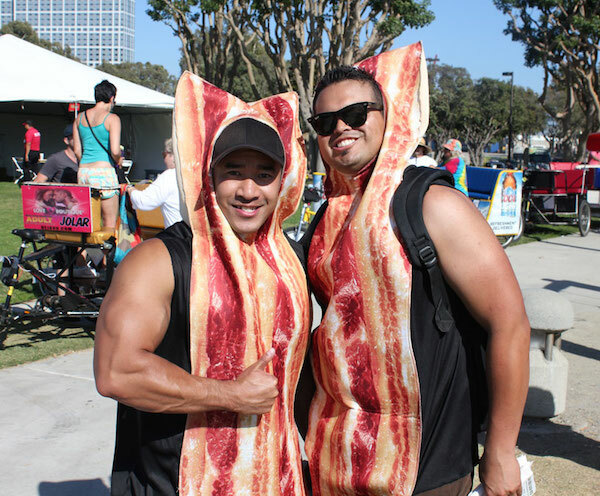 What’s better on a warm June afternoon than to hang out with hundreds of your closest friends and some of the best bars, restaurants, wineries, breweries, and distilleries in Southern California with one purpose – celebrate bacon! As someone that is always on the lookout for a great guys weekend ideas that combined food, spirits, and fun times this event piqued my interest. That’s pretty much what Bacon and Barrels is all about and no one who attended could possibly be disappointed by what they found waiting for them! 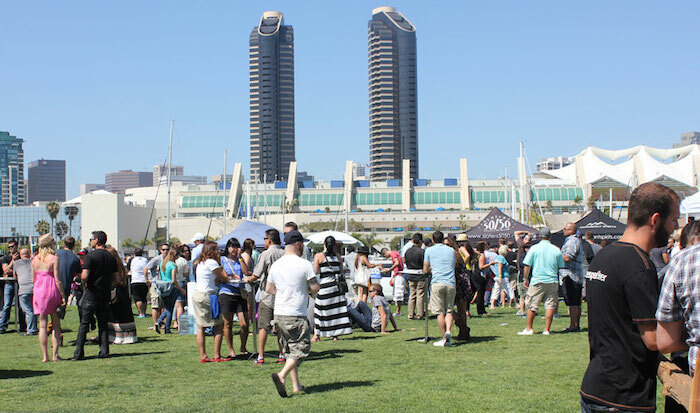 While normally held near Santa Barbara, CA this year they decided to hold a second event in San Diego this year as well. 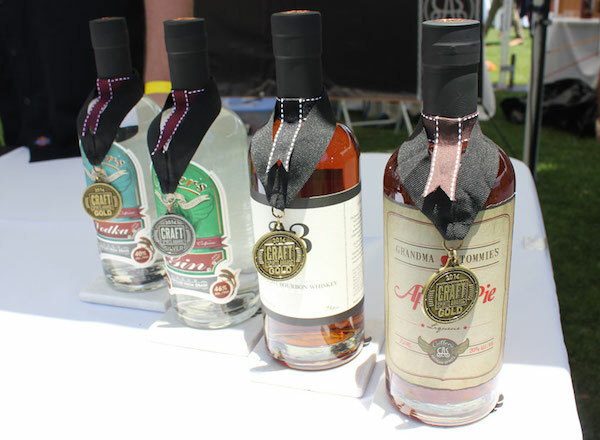 Cutler’s Artisan Spirits – brought several of their gold-medal-winning spirits including their fantastically smooth 33 Bourbon, an Apple Pie Liqueur based on their vodka then blended with apple juice, organic cassia, and vanilla as well as other spices. Most remarkable for me was their Gin since it was my first exposure to what they refer to as “New West Style” where citrus flavors are equal to the classic juniper notes. This created a remarkably refreshing spirit that I look forward to tasting more of on my next trip to their tasting room in Santa Barbara. 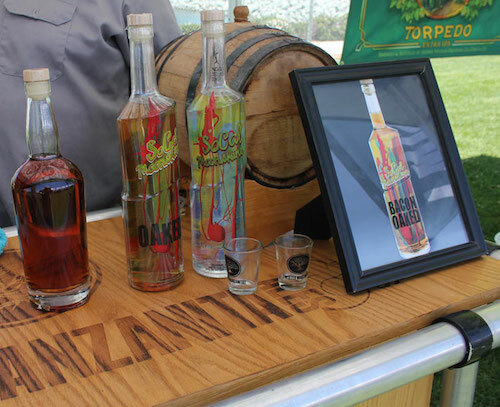 Twisted Manzanita Spirits – from San Diego was sharing their Moonshine including a Bacon Oaked variety. For someone used to moonshine from TN, KY, and GA to find one from CA with a rainbow painted bottle and distillers who don’t claim to have it based on some ancient family recipe. Instead, the founder and Head Distiller are both simply committed to making the best spirit possible and innovating where there is an opportunity to do so. On the beer side, it should be no surprise that any beer event in San Diego features a bunch of IPAs but what I was NOT expecting was to find The Ol’ Switcheroo, a double black IPA from Valiant Brewing from Orange County, CA. While still retaining the high IBU and ABV common for a double IPA, it also featured notes of chocolate that almost reminded me of a bock-style beer. The winning food entry was created by Chef Kevin Templeton of San Diego’s Barley Mash and featured bacon-wrapped crispy duck skin with Jameson-smoked paprika aioli and micro cilantro. On the food side, there was simply too much to share from bacon-wrapped jalapenos to “yak nuts” (chicken parts wrapped in bacon), pork belly waffles with maple bacon butter, and of course the Southern California favorite Slater’s 50/50 was there with their BBB Bacon Burger complete with a 50% bacon, 50% beef burger featuring two huge strips of bacon, bacon American cheese, egg, and bacon island dressing placed between a bacon pretzel bun! This was paired with the Maple Bacon Old Fashioned cocktail created by the mixologists at Eureka! 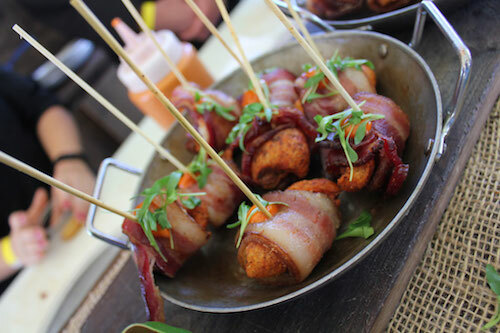 While this year’s San Diego event is over, the Bacon and Barrels event near Santa Barbara is coming up July 18-20 at Saarloos and Son’s Winery in Los Olivos, California. Article and photography by James Hills who writes about guys weekends and mancations for ManTripping.com.